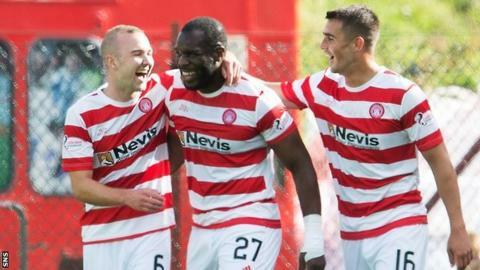 French striker Christian Nade has been released by Hamilton Academical. The Scottish Premiership club tweeted to say the move was "to allow him to sign elsewhere." Nade, 31, joined the New Douglas Park side in July last year after previous spells in Scotland with Hearts, Dundee and Raith Rovers. He played 18 times this season for Martin Canning's side, netting three goals including one in his last appearance in a 4-3 loss to Inverness.